Shortly after Errett Lobban Cord rescued the ailing Auburn Automobile Company, he wrested control of the firm and set to work shaping his luxury car empire. Cord wasted little time transforming Auburn into a style and value leader in the luxury car market. With Auburn on stable footing, Cord set his sights on creating an automobile capable of competing with the likes of Packard and Cadillac. 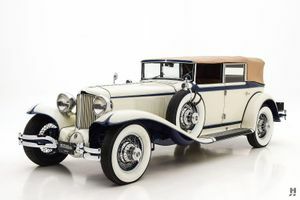 He saw a perfect opportunity to build a car that would fit neatly between the value-oriented Auburn and the spectacularly exotic and expensive Duesenberg. In typical E.L. Cord fashion, he eschewed tradition in favor of a car that was as innovative as it was beautiful. The sleek and low slung L-29 debuted in 1929, featuring a revolutionary front-wheel drive system with a De Dion front axle, designed with input from the engineers responsible for the Miller front-drive Indy Car. The front-drive layout meant the body could mount over the chassis rather than on top, which in turn allowed the L-29 to be one of the lowest production cars of the day. Cord charged Alan Leamy to create a body, and the results were stunning; distinguished by its flowing front fenders, split bumpers, and a narrow, body-color radiator shell. The L-29 shared the 301 cubic-inch Lycoming straight eight with Auburn, albeit turned 180-degrees in the chassis, driving through a three-speed transmission at the front. Thanks to the low center of gravity, handling was very impressive. The factory offered the L-29 in four styles: Convertible Sedan, 5-Passenger Brougham, Sedan, and 2/4-Passenger Coupe/Roadster. Only 5,014 L-29s were built between 1929 and 1932, as the Great Depression took hold and effectively killed the replacement L-30 before it even left the drawing board. 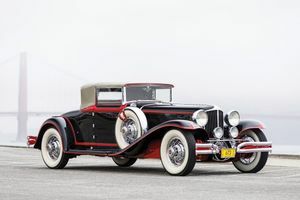 Despite its brief existence, the Cord L-29 stands as one of the most beautiful American automobile designs of all time. Exceptionally presented in brilliant colors, this Cord L-29 Cabriolet is a stunning example of America’s front-wheel-drive pioneer. Beautifully turned-out with a world-class restoration by a noted marque expert, this desirable later production example featured original chassis, body, and the more powerful 322 cubic-inch ‘FF’ series engine. In the mid-1980s, a lifelong Cord enthusiast discovered this car hidden away in a Key West, Florida garage. Said to be a remarkably complete, sound and rust free example when found, the owner purchased it with the intention of restoring it to concours standards. Sadly, he did not see his plan come to fruition; however, his brother (also a dedicated Cord aficionado) later acquired the car and eventually commissioned the kind of restoration it so deserved. The owner entrusted the Cord to Ken Clark of Ken’s Classics in Pittsfield, Maine to perform a highly detailed restoration to exacting standards. Mr. Clark is a foremost expert on Cord automobiles, and his painstakingly researched projects have won countless awards and accolades through the years. For this car, Clark and his team meticulously researched and restored every component down to the smallest detail, noting along the way that this car retained much of its original wooden body frame as well as the original serial number tag. They capped off the project by finishing it in a visually striking two-tone blue livery with chrome wheels, black wall tires and gray upholstery. Fresh from restoration, it earned its ACD Club certification as a Category 1 Original Car. Shown extensively within the ACD Club, honors include the Alan Leamy Award for Best L-29 at the 2014 National Reunion. It is also a Senior Award winner in both the AACA and CCCA, and a Lion Award recipient at the Concours d’Elegance of America at St. Johns. Importantly, the driving experience was not overlooked, and Clark ensured this L-29 was dialed-in and properly sorted for touring and rallies. In addition to racking up concours trophies, it has been a regular participant on events like the ACD Festival Hoosier Tour, and ACD Club Spring Meet tour. The current owner takes pride in this being one of the best-performing L-29s and has not been shy about enjoying it to the fullest on the road. The presentation remains outstanding, with excellent quality paint, brightwork, and detailing. It is a stunningly beautiful car, with the vivid two-tone blue paintwork playing beautifully with the sporting Cabriolet coachwork. Minimal accessories give the car a lean and purposeful appearance; accentuating the low, long profile. With the world-class restoration now taking on a lightly mellowed character, this remains one of the most arresting and exquisitely detailed L-29s in existence. Gray leather upholstery complements the paint beautifully, and it remains in lovely condition, with some light signs of use on the driver’s seat that reveals this car has been enjoyed on the road as much as it has on the show field. Correct gauges and switches grace the dash, which is restored to the same high standard. Carpets, door panels, and rumble seat upholstery all remain in excellent order. The cabriolet top is trimmed in taupe Canvas with a just a hint of blue to tie in with the paintwork. Under the long hood rests the improved version of Lycoming’s inline eight-cylinder engine. Bumped from 301-cubic inches to 322-cubic inches and equipped with revised manifolds, the “FF” series engine got a welcome boost in power to improve performance over earlier examples. Remarkably, this car retains its original engine as researched by Ken Clark. It presents in beautiful condition, in its signature bold green with chrome hardware. Detailing is excellent, belying its participation in several tours and road events, it remains in superb cosmetic condition. Few examples of the Cord L-29 have achieved such a record on the show field while also being proven on the road. Furthermore, this car not only offers concours quality detailing but it also retains its original body, chassis, and engine. Exceedingly rare and marvelously presented, this Cord L-29 is an icon of the Classic Era that is sure to satisfy discriminating collectors.